This piece is inspired by the massive streetwear trend for men. Side-seamed, Retail fit, Longer body, Rounded bottom hem, Drop tail. 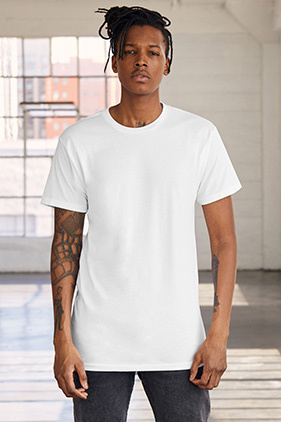 Long Body Tee features side seams and a rounded drop-tail hem. This statement-making jersey basic is available in premium combed and ring-spun cotton (solid colors) or cotton-poly (heather colors). Solid: 100% Airlume combed and ring-spun cotton, 30 single, 4.2 oz.